What's new on the site and with the convention? Join the Leap Back 2009 Photo Gallery! See our photos and upload your own collection. Guest intro segments, tributes, contest videos, and deleted scenes not included on the official DVD! 51 special guests and stars attended the convention including SCOTT BAKULA! The weekend schedule plus special events and contests! Information on the convention facility and location. A look back at many Quantum Leap conventions between 1992 and 2001. Thank you to all our fantastic volunteers over the weekend! The Starlight Children's Foundation wishes to thank those of you who have purchased the 4-disc DVD set of The Leap Back 2009 20th Anniversary Quantum Leap Convention. Your support has enabled us to continue to help seriously ill children and their families cope with their pain, fear and isolation through entertainment, education and family activities. We remain grateful for being the chosen charity of The Leap Back 2009 Convention and we hope to continue the wonderful relationship we have had in the past with the Quantum Leap fans. Now available in limited quantities! T-shirts, bumper stickers, clocks, pins, & more are now presented by Al's Place Quantum Leap Fan Site. Join us at the official convention forum! The convention is over, but have a look at the ticket packages that were offered. We hope you enjoyed your stay during the convention weekend at our on-site hotel, Beverly Garland's Holiday Inn. From locals in Hollywood to overseas leapers, here's how we got there! Thank you all for your hard work (producers, staff and volunteers!) and thanks to everyone who bought tickets and memorabilia and participated in the event! The programs and interviews and artwork were very well done and classy! A special thank you to all the Q.L. guest stars and to the old Q.L. team who gave so generously of their time! I will treasure the beautiful glass commemorative "award", while acknowledging that EVERYONE involved with the convention had a hand in making Sam a "Timeless Character"! And a very special nod to my friend and publicist of many, many years, Jay Schwartz, who not only won the trivia contest, but I think at times loves the show more than all of us! He worked tirelessly behind the scenes (and in front!) to help make the weekend a success! Good luck and good health to you all, and again..... Thanks for the Memories!!! Hello Leapers! It’s been a pleasure serving you and celebrating with you as the President and CEO of The Leap Back 2009, Inc. As of January 1st, 2010, the corporation will be closed and I’ll go back to being “Al’s Place Bartender” but it’s been a great experience for me overall and I thank you for all your support over these past few years from the first day we opened leapback2009.com in July of 2006 up until now. I look forward to being with you as we continue to celebrate Quantum Leap and our wonderful fandom. Please enjoy the DVD of the convention and thank you again for the memories we’ve had, and in advance for the continued enjoyment of this amazing program that we’ll have in the future. I’ll see you over at Al’s Place soon I hope! Thank you to all the fans who made this convention such a huge success both for the Quantum Leap fandom and for the Starlight Children's Foundation! You helped raise over $41,000 for children with serious illnesses, truly helping to put right what once went wrong. Thank you from all of us at The Leap Back 2009! Don't forget to order your DVD set of the historic event! The Leap Back 2009, Inc. was founded as a non-profit 501(c)(3) corporation, which organized a convention dedicated to the preservation and appreciation of Quantum Leap which by doing so, benefited the Starlight Children's Foundation. No copyright infringement was intended. All guests agreed to participate pending any unforeseen commitments. 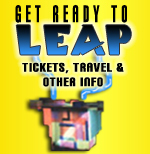 Use of this site and/or your purchase of a ticket to The Leap Back 2009 Quantum Leap convention signified acceptance of our policies as outlined HERE. "Quantum Leap" logo courtesy Universal Studios Licensing LLLP. Get this bumper sticker in the Al's Place shop now! Or choose from dozens of other great items to celebrate the 20th anniversary convention.